India paper engraving (dimensions c. 22 x 16 cms) neatly laid down on piece of wove paper c. 29 x 22 cms. Very good, with the slightest spotting, and with minor creasing and staining to the extremities of the mount. A pensive Murray sits in an armchair, reading a manuscript. Typed Letter Signed ('W. H. Rylands') to [Josiah] Conder, concerning an engraving of the Temple in Jerusalem. 4to, 2 pp. Thirty-six lines. Text clear and complete. Good, on lightly-aged and creased paper. 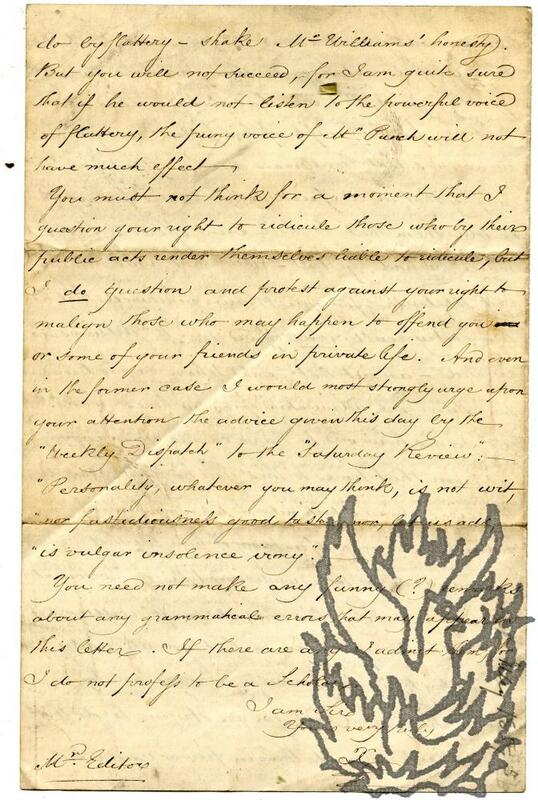 Rylands thanks Conder for the trouble he has taken 'about this plate of the Temple'. Discusses an edition of Josephus, and a possible painting by Parmentier of 'the building of the Temple and not the Temple built'. Discusses the origin of the plate Conder has sketched, with architectural references. 'Schott's engraving was often copied, [...] Fergusson, with all his study, did not come to anything better'. Rylands was initiated in the Lodge of Faith and Unanimity No. Trade catalogue, in French, of books in 'Anthropologie et Zoologie', sold by H. Welter, 'Export-Agent and Dealer in Second-Hand Books'. Autograph Letter Signed to [L. Williams](an artist). Novelist (1770-1844)(DNB). One page, 4to, bifoliate (blank except for Williams' name and address), some marking but text clear and complete. "I am much pleased with the design inclosed but have to observe that I think the tall boy a little too tall and that his trousers have more the look of a young sailor than those of e gentleman - the farmer boy is excellent - the lake scene very prettty and the whole satisfactory. I had great pleasure in naming you as an artist of great promise to Mr Newman who does a great deal of business & is a very worthy man and good judge of art . . . N.B. Novelist. Two pages, 4to, chatting about personal matters and a MS. by a Mr Bligh which Rosamund Lehmann and C. Day Lewis wish to recommend for publication. [A note added to the letter in Goerge's [?] 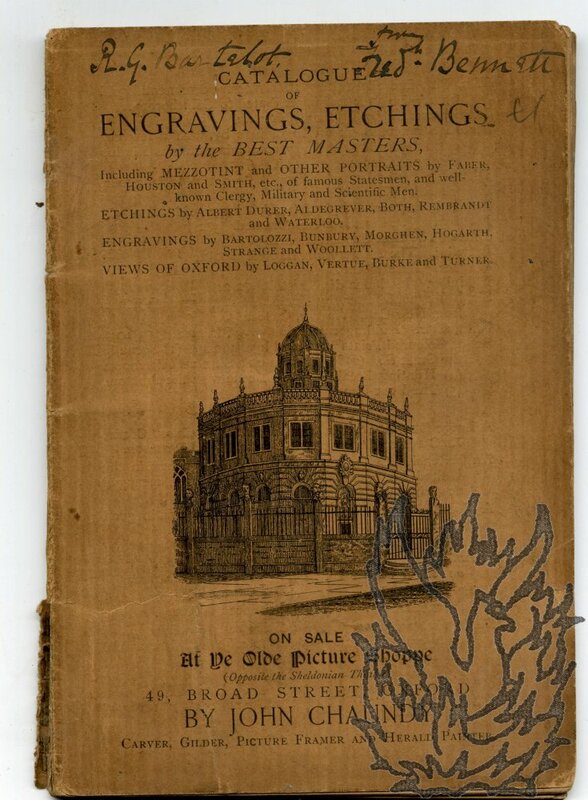 hand says that the book was published by Secker & Warburg.] She looks forward to the end of the War, concluding with impromtu verse: "I want to climb a steeple/ I want to ring the bell,/So I can tell the people/I love them all so well". 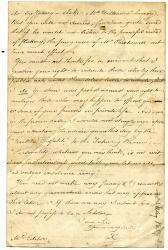 Autograph Letter Signed to Wilson. 12mo: 2 pp. Twenty-eight lines of closely-written text. Clear and complete. Good, on lightly-aged paper. She has received his letter and the cheque for £7 10s 'for the Vidal', about the sale of which and the price she is 'very much pleased'. 'You do not mention the commission [...] I hope for good luck with Hall's Stradivari later.' His 'kindness [...] is greatly appreciated'. 'I hope to come in one day when the spring is really here. 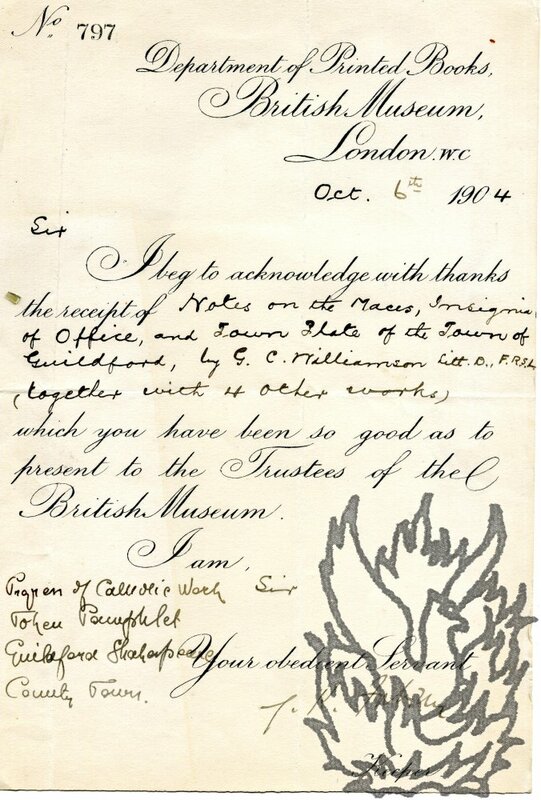 Autograph Letter Signed to the numismatist Ewald Junge, with papers relating to the artist and theatrical Edward Gordon Craig (1872-1966). 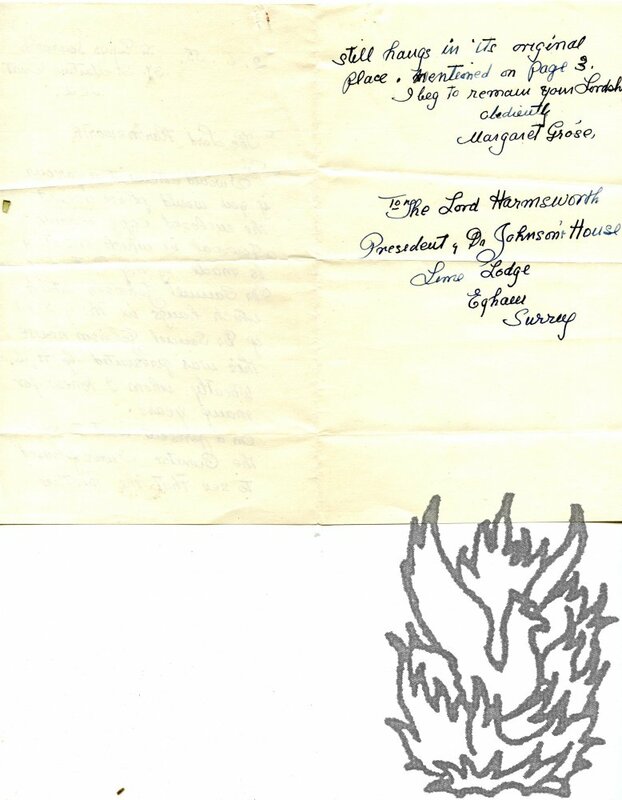 Letter undated, on letterhead of Victoria House, 40 Oxford Road, Cambridge. LETTER: One page, quarto. Somewhat aged and creased. An attractive item in Carter's disciplined calligraphic hand. A damning assessment of Craig's son Edward Anthony Craig ('Edward Carrick', 1905-98). '[...] If you know him, you presumably also know what you are taking on! 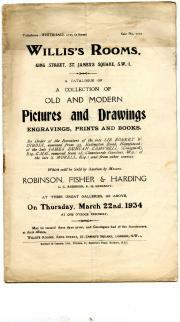 We had some dealings with Teddy over possibly printing old EGC's engravings of Robinson Crusoe, but Teddy sold them, [...] My impression is that the old rogue manufactured archives in order to sell them to someone - preferably twice. Three items (a printed announcement, invoice and receipt) relating to Johnstone & Hunter's edition of Dr John Owen's 'Works'. All three items in good condition, a little grubby and lightly creased. Three pieces of nineteenth-century Scottish book trade ephemera. Item One (12mo, 1 p, nine lines of text): printed announcement that the 'concluding Volumes of our Edition of OWEN'S WORKS [...] will not be sent to Subscribers in arrear'. On the recto of the first leaf of a bifolium, with the verso of the blank second leaf docketed by Alsop. Item Two (12mo, 1 p, on grey-paper printed form): invoice, 'To JOHNSTONE & HUNTER, 15 PRINCES STREET. ', dated June 1855. The subscription of 'J. Allsop Esqr. Autograph Letter Signed ('W Beattie. MD.') to the editor of the 'Naval and Military Gazette'. 13 August ; St James's Street, London, on embossed letterhead of the Conservative Club. 16mo (11 x 9 cm) bifolium, 3 pp, 16 lines of text. Mourning border. Good, with slight discoloration to the external pages. He is sending a manuscript 'At the suggestion of the Author, an officer residing in Paris'. If 'on examination' the recipient considers it 'unsuitable for the pages' of the Gazette, he asks for it to be returned to him at 13 Upper Berkeley Street 'when your messenger happens to pass that way'. The author 'is a man of high character and well acquainted with Paris & the Parisians'. Autograph Letter Signed ('Geo. 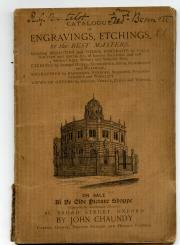 Combe') to Messrs Bell & Bain, Printers, Exchange Court [Glasgow]. 20 April 1836; 81 Bath Street [Glasgow]. 8vo, 1 p. Addressed by Combe on the reverse, to which his monogram seal in red wax (with his motto 'RES NON VERBA QUAESO') still adheres. 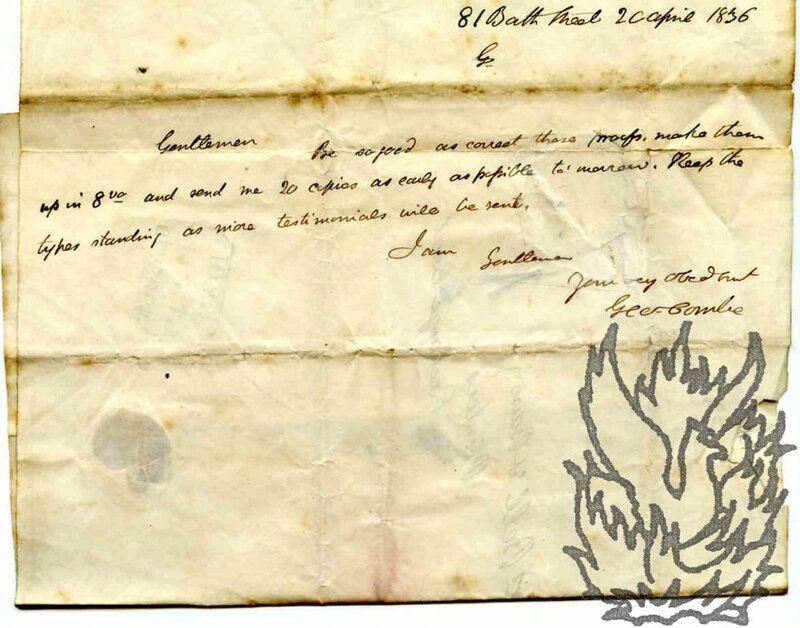 In poor condition, on discoloured paper, with damage to a few words of text above the signature caused by clumsy removal from the mount, a part of which still adheres to the reverse. Repaired with archival tape. The letter presumably concerns 'Additional testimonials on behalf of George Combe, as a candidate for the chair of logic in the University of Edinburgh' (1836). It reads 'Gentlemen | Be so good as correct these proofs, make them up in 8vo. 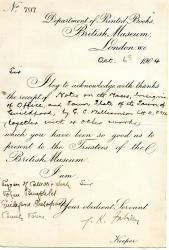 Autograph Letter Signed to his publisher and friend Alexander Macmillan. 1 February [no year]; on letterhead of Paston House, Paston Place, Brighton. 12mo, 1 p. Six lines of text. Good, on lightly aged and creased paper. 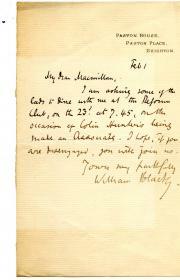 Inviting Macmillan to join him and 'some of the lads' in a dinner at the Reform Club, 'on the occasion of Colin Hunter's being made an Associate'. Autograph Letter Signed ('Geo: D. Ballingall') from Ballingall to Shorter, as editor of 'The Sphere' newspaper, regarding a legal action involving Crooke, Scots Pictorial Publishing Co. Ltd. and Hodge & Co.
Two Autograph Letters Signed (both 'Alec Maclehose') from Alexander MacLehose; and one Autograph Letter Signed ('James MacLehose'); all three to John Gideon Wilson. 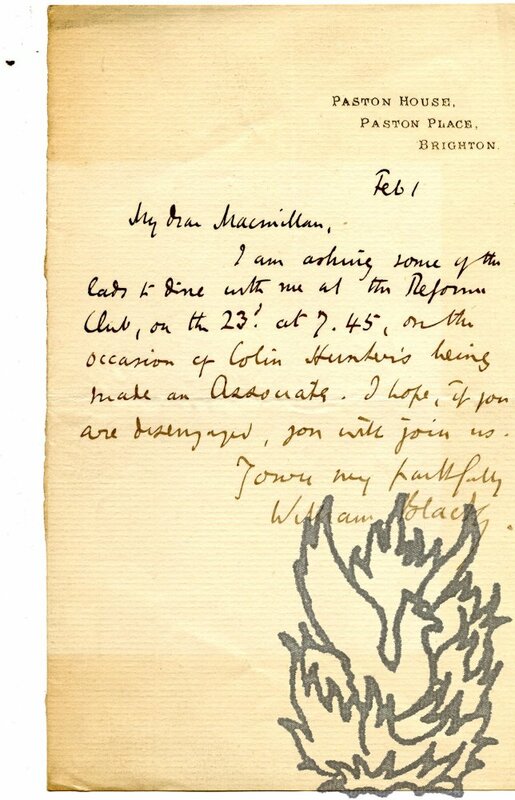 Alexander MacLehose: 10 August 1931 and 23 June 1932; both on letterhead of Alexander MacLehose & Co., 58 Bloomsbury Street, London, W.C.1. 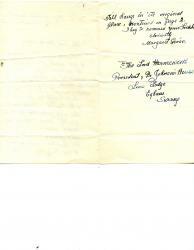 James MacLehose: 20 November 1931; on letterhead of Saint Johns House, 30 Smith Square, Westminster, S.W.1. Alexander MacLehose: Letter One: 4to, 1 p. Good, on slightly aged and lightly creased paper. 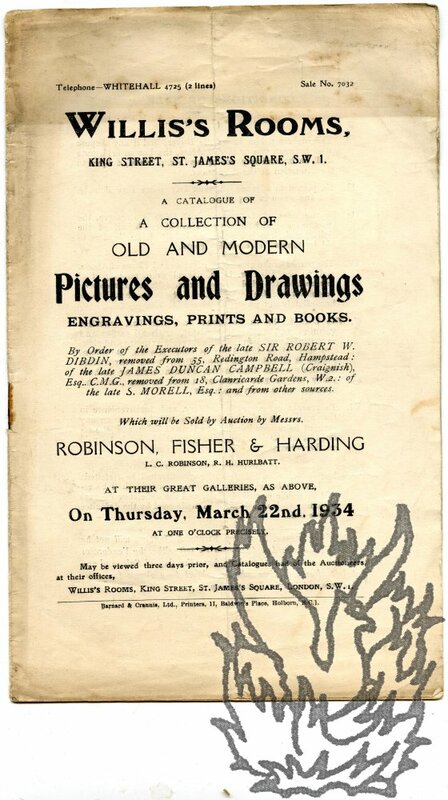 He is sending a copy of his catalogue, 'which has reached me from the printers to-day'. He has 'sent a copy also to the firm'. Would like Wilson's 'advice as to whether "Memories of the Months" should have a paper jacket. The binders have sent me a nice cellophane cover, which shows the rather handsome binding. Would there be any objection, from a selling point of view, to a cellophane cover in place of the ordinary paper jacket?' Letter Two: 12mo, 2 pp. 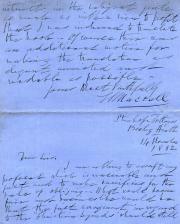 Autograph Letter Signed ('W Maccall') [to the publishers W. S. Sonnenschein & Co.]. 14 November 1882; Stanhope Cottages, Bexley Heath. 4to, 1 page and 12mo, 2 pp (single 4to leaf, folded as to give two 12mo pp on one side). Thirty-seven lines of text. 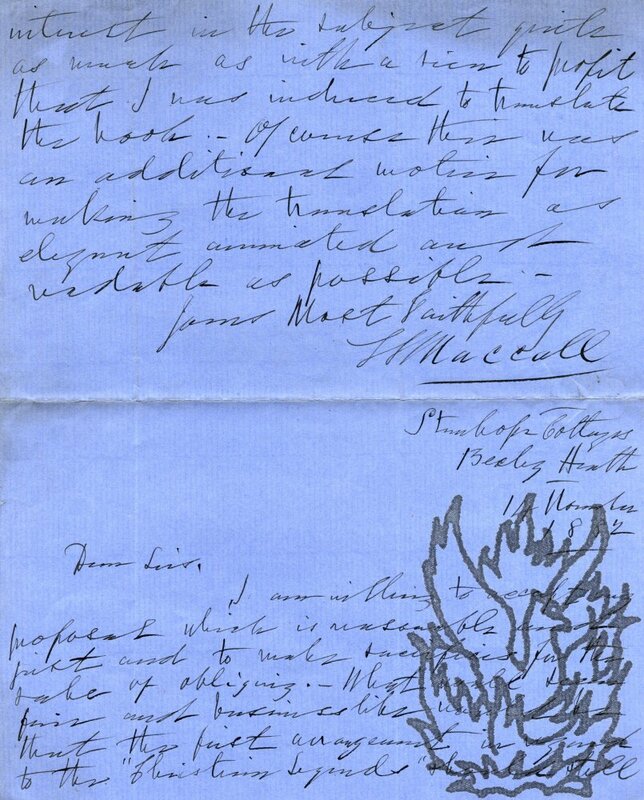 Maccall is 'willing to accept any proposal which is reasonable and just' concerning his 'Christian Legends' (published by Sonnenschein in 1882), and also 'to make sacrifices for the sake of obliging [...] As the one manuscript is about twice the length of the other - I speak from memory, - it might honestly claim better remuneration'. 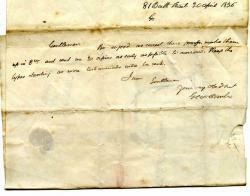 Autograph Letter Signed ('David S. Meldrum') to unnamed female correspondent. 8vo: 3 pp. On grubby, lightly creased paper. The recipient has made Meldrum a 'pretty present' of her edition of Burns (COPAC provides no clue as to her identity). He finds the volumes 'very dainty', and will read her notes 'with interest'. He has already read her 'Introductions' with 'great pleasure'. He comments on her assessment of a couple of poems and finds her 'standpoint' on 'the man & the poet' 'capital'. 'But you must allow me one criticism: you read into the poems a political significance which I'm sure wasn't there.